Freckles 18's Story . . .
Miss Freckles is not picking up much, but she may just be waiting for that right person and technique to get her to start learning, or, maybe she’s just tired of this summer’s heat! She seems very excited over treats and prefers dancing to “sit-stay” or learning “down.” Her foster mom is focusing on “stay” with very slow results. This senior lady is moving and grooving quite well. She runs up the stairs with no problems, zooms around the yard, and goes back down with just a bit of a hop. Leash work and walks have been put on hold until cooler weather to protect this beauty’s paws and pads from hot concrete and blacktop. 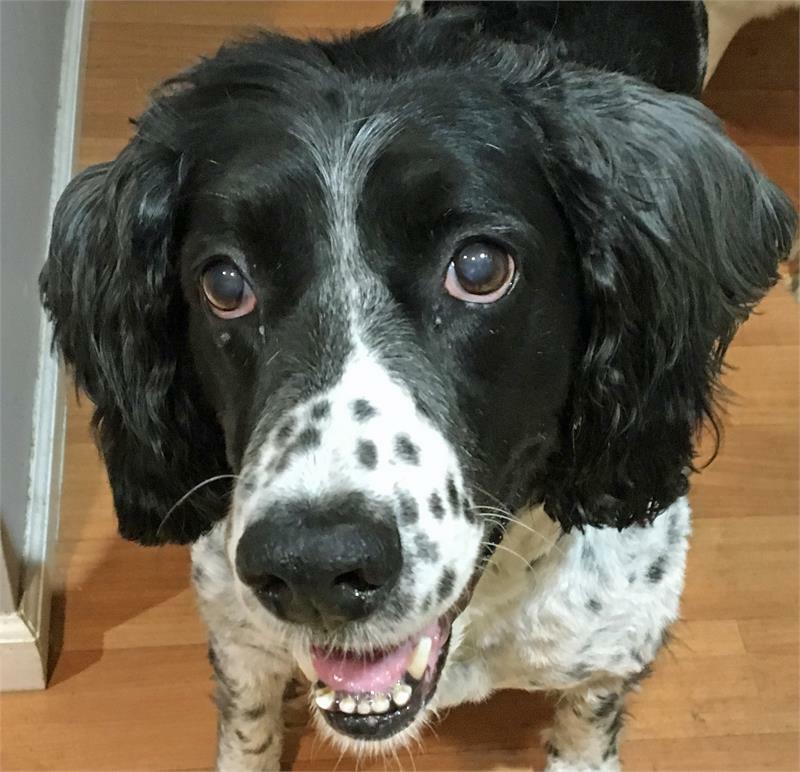 Looking for a mature Springer who would like to be your one and only? Keep MAESSR’s Freckles in mind. Just look at those eyes and perfect freckles and see if you can resist this love. Freckles has been taking anti-inflammatory meds and supplements for the arthritis in her joints. One medication is an injection which should continue to help improve her mobility. Currently she is doing well on this regimen and doesn't seem to let the stairs hold her back. She runs up and down them, following her foster mom no matter how many times she must go up or down throughout the day. This is also a sign that she likes being close to her human! Although she hasn’t returned to the vet to check her ears, her foster mom reports that they are looking so much better. When comfy and happy, Freckles is almost always ready to play with her foster mom and either a ball or a squeaky soft toy. She shows a youthful energy when ready to play or excited to go out in the backyard. Every once in a while, she'll act like she wants to play tug with the resident male canine but hasn't been successful yet. She has not shown any interest in swimming when around the pools. With a neighbor’s Fourth of July celebration, Freckles demonstrated that she does not like fireworks at all. She was placed in a Thundershirt, which took the edge off, but she was trembling as long as there were fireworks being set off. Freckles has traveled to two dock diving events with her foster mom. She seems to be scared or stressed by being around more than one dog, especially if they are barking. Her foster mom had brought a crate along which Freckles chose to stay in. She also became slightly protective of the crate even with her canine foster brother, curling her lip and grumbling. She did come out when walked by her foster mom who thinks that Freckles might prefer to be an only dog or live with a like-minded, similar energy level, quiet brother or sister. Commands that Freckles continues to work on are “down,” “wait,” and “stay.” Her leash manners are still a work in progress as well. Freckles still has had limited exposure to children. She did meet a young toddler in a stroller; she was hesitant at first but then did just fine. Due to her age and arthritis, any children in Freckles’ forever home would need to be old enough to respect the needs of a senior dog. Freckles would love a forever home that is quiet and loving. Few stairs would be most beneficial for her. This sweet people-dog is looking for that special family that would be perfect for her. Might that be you? Original: "A very sweet girl that just wants love and reassurance, Freckles has been a wonderful house guest in her new home." Freckles is one happy girl now that MAESSR found her! When her prior owner surrendered her to a shelter in Pennsylvania, she didn’t realize that her luck was about to change and that she would soon be in the care loving MAESSR volunteers. After spending a brief time in a temporary foster home, Freckles took a long trip to her current one. It took a few days for Freckles to settle in, as she was quite stressed from the transport and joining another new home. Finally she began eating and letting her personality shine. Her foster mom says that she is super sweet and very cute, especially after the spa grooming that revealed the beautiful pup underneath all of her unkempt fur! Although she is 10 years old, Freckles has her moments when she acts like a young pup. She loves toys…especially if they squeak! Currently she is having some difficulty with stairs since her back legs appear to be painful. Further examination will take place to evaluate and treat them. Additionally, Freckles licks and chews her paws. It’s possible that she has some mild seasonal allergies, so this behavior will continue to be observed as well. 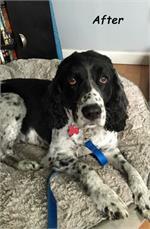 A very sweet girl that just wants love and reassurance, Freckles has been a wonderful house guest in her new home. This good girl doesn’t try to jump on the furniture and, although she “noses” at the counter, she is not a counter surfer at all. She loves the fluffy soft gray dog bed in the living room and she sleeps there most of the day. There have been no accidents inside, and Freckles usually will go right outside to go potty quickly. There are times, however, that she needs a bit of a push to go outside so her foster mom will put her on a lead and guide her out. Freckles has not been put in a crate; her foster mom learned that in her temporary foster home she barked and whined when crated. She is very calm inside the house unless her foster mom brings out a toy out that squeaks. She will play for a few minutes, but settles right back in when she needs to rest. At night she sleeps on the floor, usually on a bed next to her foster mom. 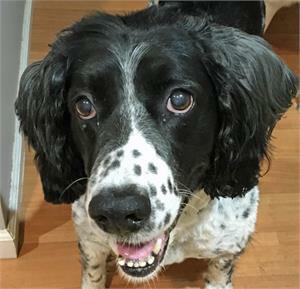 Unlike many Springers, Freckles is not a fast eater; she picks and nibbles and will walk away if her person is not standing with her as she eats in the kitchen. She does prefer having her bowl raised. She has shown no signs of resource guarding. Currently Freckles is eating a mix of dry and canned food because she wouldn’t touch dry kibble alone. In order to get her to eat, her foster mom enticed her with the addition of the wet food. When out walking, Freckles will pull on her leash. She is very strong, even though her rear legs are weak. She does know “sit,” but isn’t as strong with “down” or other commands. Her foster mom hopes to spend more time with her in the coming week to work on commands. 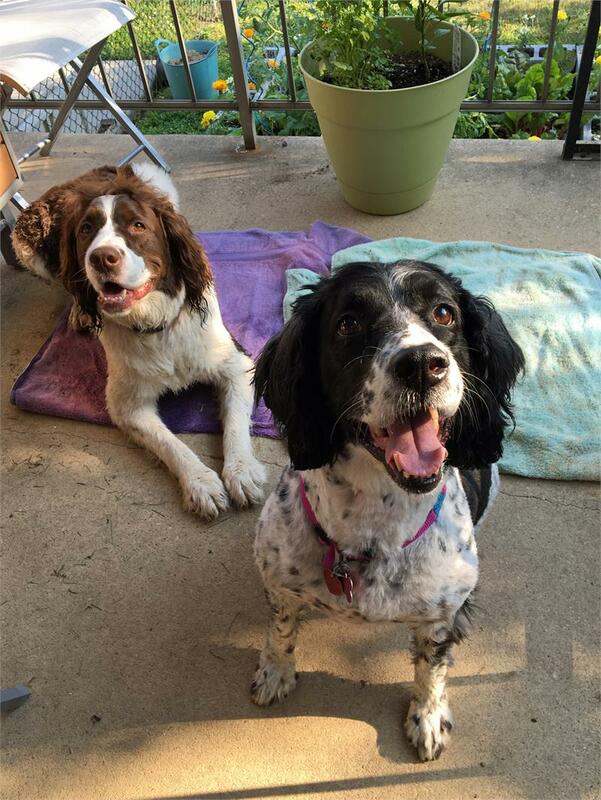 A canine foster brother lives with Freckles and she has done great with him. Initially they ignored each other as best they could; they now have gotten to the point where they will trot side by side on walks. They even hang out in the yard once in a while and recently almost shared a bed. As a precaution, however, they are separated by a baby gate while her foster mom is at work. 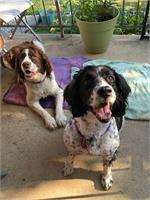 Freckles and her foster brother joined their mom on a trip to visit her parents. On the way there Freckles paced back and forth in the back seat. She was fairly quiet otherwise, but just couldn’t settle in for long. During their visit she met the resident cats who hissed and popped at her. This scared Freckles and she left them alone. (In her temporary home, she was very gentle with the friendly resident kitty.) She also did not like it when the three resident Springers would get going barking in their excitement to go outside. Freckles would tremble and try to get away from them. Otherwise she was great with the dogs and caused no problems, only returning a bit of a grumble when she was growled at by the jealous resident male. On the way home Freckles sat in the front seat and enjoyed watching the world go by, nudging her foster mom for love and pets. 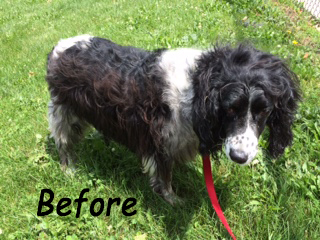 Freckles did great at the groomer who did not have any issues with her while she received a bath and was trimmed down. She was also very good at the vet…until they swabbed her ears. When they swabbed she was not happy and squirmed around. It turns out that Freckles was uncomfortable from a minor ear infection and is receiving treatment for it. Freckles is set to get x-rays taken of her rear right leg in the near future; currently she would do best in a home with as few stairs as possible. She is a Velcro girl and will whine (sometimes bark) if she can’t see or be with her human. She seemed to be fine, however, while her foster mom was at work as her neighbor hasn’t mentioned any extra barking when she’s home without her human. Senior Springers like Freckles have so many wonderful qualities and so much appreciative love to give. This beautiful, sweet girl soon will be looking for her forever family to give her the love that she so deserves.